The Painted Veil is a 2006 American drama film directed by John Curran. The screenplay by Ron Nyswaner is based on the 1925 novel of the same title by W. Somerset Maugham. Edward Norton, Naomi Watts, Toby Jones, Anthony Wong Chau Sang and Liev Schreiber appear in the leading roles. This is the third film adaptation of the Maugham book, following a 1934 film starring Greta Garbo and Herbert Marshall and a 1957 version called The Seventh Sin with Bill Travers and Eleanor Parker. On a brief trip back to London, earnest, bookish bacteriologist Walter Fane (Edward Norton) is dazzled by Kitty Garstin (Naomi Watts), a vain London socialite. He proposes; she accepts ("only to get as far away from [her] mother as possible"), and the couple honeymoon in Venice. They travel on to Walter's medical post in Shanghai, where he is stationed in a government lab studying infectious diseases. They find themselves ill-suited, with Kitty much more interested in parties and the social life of the British expatriates. Kitty meets Charles Townsend (Liev Schreiber), a married British vice consul, and the two engage in a clandestine affair. When Walter discovers his wife's infidelity, he seeks to punish her by threatening to divorce her on the grounds of adultery, if she doesn't accompany him to a small village in a remote area of China. He has volunteered to treat victims of an unchecked cholera epidemic sweeping through the area. Kitty begs to be allowed to divorce him quietly, but he refuses, stating "Why should I put myself through the smallest trouble for you?" She hopes Townsend will leave his wife Dorothy and marry her. When she proposes this possibility to Charles, he declines to accept, despite earlier claiming to love Kitty. She is compelled to travel to the mountainous inland region with her husband. They embark upon an arduous, two-week-long overland journey, which would be considerably faster and much easier if they traveled by river, but Walter is determined to make Kitty as unhappy and uncomfortable as possible. Upon their arrival in Mei-tan-fu, she is distressed to discover they will be living in near-squalor, far removed from everyone except their cheerful neighbor Waddington, a British deputy commissioner living with Wan Xi (Lu Yan), a young Chinese woman, in relative opulence. Walter and Kitty barely speak to each other and, except for a cook and a Chinese soldier assigned to guard her, she is alone for long hours. After visiting an orphanage run by a group of French nuns, Kitty volunteers her services, and she is assigned to work in the music room. She is surprised to learn from the Mother Superior that her husband loves children, especially babies. In this setting, she begins to see him in a new light as she learns what a selfless and caring person he can be. When he sees her with the children, he in turn realizes she is not the shallow, selfish person he thought her to be. As Walter's anger and Kitty's unhappiness subside, their marriage begins to blossom in the midst of the epidemic crisis. She soon learns she is pregnant, but is unsure who the father is. Walter – in love with Kitty again – assures her it doesn't matter. The cholera epidemic takes many victims. As Walter and the locals are starting to get it under control, due to his importation of clean water through a system of aqueducts (as the local people did not understand water-borne infectious disease[better source needed]) cholera-carrying refugees from elsewhere pour into the area, forcing Walter to set up a camp outside town. He contracts the disease and Kitty lovingly nurses him, but he dies, and she is devastated. Bereft and pregnant, she leaves China. Five years later, Kitty appears well-dressed and happy in London shopping with her young son Walter. They meet Townsend by chance on the street, and he suggests that Kitty meet with him. Asking young Walter his age, he realizes from the reply that he might be the boy's father...except that, when he hears him speak and looks at him, the boy seems like a miniature Walter. Kitty rejects his overtures and walks away. When her son asks who Townsend is, she replies "No one important, darling". Prior to 1999, producer Sara Colleton sought to develop a script for The Painted Veil. The script was frequently redrafted, being written to be close to the source material, to take liberties with the source material, and to create a feminist version. Actor Edward Norton became involved with the project in 1999. Norton explained his attraction to the project, "It's very much a story about people getting beyond the worst in themselves and figuring out how to look at each other honestly, forgive each other for their failings and get to a better place... When I read it, I was very affected by it because in it I saw my own failings." The actor suggested casting Naomi Watts for the role of Kitty, which did not happen until Watts proved herself a bankable star with her performances in Mulholland Drive (2001) and 21 Grams (2003). When Watts joined the project, she recommended director John Curran, with whom she had collaborated on the 2004 film We Don't Live Here Anymore. The director's expertise with We Don't Live Here Anymore convinced Watts and Norton that he would be capable of depicting the dysfunctional relationship in The Painted Veil. The project began development at producers Bob Yari and Mark Gordon's Stratus Film Company, but when Stratus executive Mark Gill left to start Warner Independent Pictures, he brought the project with him. Gill began production of the film in partnership with Yari. Gill was later fired before the film's completion by Warner Bros. production president Jeff Robinov, which later led to the film's marketing difficulties. Yari and Warner Independent Pictures collaborated with a Chinese partner who was granted approval over the script and the finished film. The partnership permitted a budget of $19 million for The Painted Veil. When the Chinese production company reviewed the film, it was unhappy with the depiction of the Chinese uprising and the cholera victims, requesting that the scenes be revised. Norton and Curran expressed concerns that their studio accepted the censorship too quickly, with the director threatening to remove his name from the film. Their pressure resulted in limiting cuts from the film to only 38 seconds' worth. Screenwriter Ron Nyswaner and Norton collaborated on the screenplay for the film. The 1925 novel by author W. Somerset Maugham was considered one-dimensional, so Norton altered the story so the character Walter Fane had a more enhanced role. The character was also rewritten to make his peace with his wife Kitty, leading to them falling in love with each other. Norton explained, "I like to think that we didn't change the book so much as liberate it. We just imagined it on a slightly bigger scale, and made external some of what is internal in the novel." Norton described the novel as "almost unremittingly bleak" and believed that the author had thought that British colonials were unlikely to change. The actor explained of the change to the story, "I went on the assumption that if you were willing to allow Walter and Kitty to grow... you had the potential for a love story that was both tragic and meaningful." Norton considered The Painted Veil to be in the spirit of films like Out of Africa (1985) and The English Patient (1996), seeing it as "rooted in really looking at the way that men and women hurt each other". Director John Curran suggested setting the film during 1925, when the events of the Chinese nationalist movement were taking place. Norton, who had studied Chinese history at Yale University, agreed with the suggestion. To detail scenes from the time period, Curran, Norton, and Nyswaner relied on excerpts from historian Jonathan Spence's 1969 book To Change China, which covered the inept efforts of Western advisers during these years. Norton described the character Walter Fane served as "the proxy for the arrogance of Western rationalism", explaining about Fane's confusion at the lack of gratitude for his help, "Walter means well, but he's the folly of empire, and that adds a whole new dimension to what happens in the story. It's a metaphor for the way empires get crushed." Filming took place on location in Shanghai, China. The director did not want to build a set for the cholera-stricken village, instead seeking out an untouched parcel of land in China. He found Huangyao Ancient Town (黄姚古镇, huángyáo gǔzhèn) in Guangxi Zhuang Autonomous Region, which served as the location for the village. The director described the location, "Even the Chinese crew members were amazed at the place we found... It was like going back in time." According to Nyswaner, a large amount of time of the film production was spent negotiating with the Chinese government for the completion of the film, as there were disagreements over issues in the script. Most of the film was shot in Guangxi. Director John Curran commented, "We wanted this movie to be distinctly Chinese. We didn’t want it to look like a film that you could shoot in Canada or Mexico or Italy." After a search of location in Hunan province, the scouts chose the location in Guangxi for the film. Line producer Antonia Barnard states that initially the film, like the novel, was going to be set in Hong Kong; however, the crew realized Hong Kong of the time period would be difficult to replicate, thus the story was altered so it would take place in Shanghai; the crew shot "Shanghai for Shanghai in the period, and shot London scenes in Shanghai as well." The official soundtrack is composed by Alexandre Desplat. "À la claire fontaine" (Vocals by N. Porebski / L. Descamps, Piano by Roger Pouly, Courtesy of Les Petits Minous). This is heard after the funeral of Dr. Fane. The film's post-production schedule was initially slated to conclude in late summer 2006, but did not finish until November. According to Laura Kim, the marketing and publicity head of Warner Independent Pictures, the delay slowed award and media recognition for the film. Other studios were duplicating DVDs of their films for awards organizations, so The Painted Veil was unable to get first priority in processing. When The Painted Veil experienced a limited release in the United States on December 20, 2006 in the cities of Los Angeles and New York City, the meager marketing campaign for the film was criticized. The lack of attention caused half a dozen people associated with the film to complain about how Warner Independent Pictures was conducting the marketing campaign. Film critic Rex Reed of The New York Observer wrote, "Nobody can understand why Warner Independent Pictures is keeping this movie such a secret; it is filled with Oscar possibilities that should be shouted from the rooftops." The firing of Mark Gill, one of the initial producers of The Painted Veil who brought it to Warner Independent Pictures, was cited as a reason for the small scale of the film's marketing campaign. Director John Curran explained about the move to Warner Independent, "Any transition is not going to be ideal. When the guy who has gotten you on board is gone, you're kind of exposed." Others also criticized the studio for not providing a large enough marketing budget, pointing out that the previous year's Good Night, and Good Luck had a more successful campaign with television and newspaper ads. 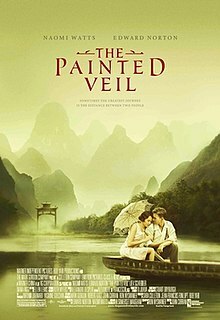 The Painted Veil was eventually able to expand to 23 more markets on December 29, 2006, with additional cities on January 5, 2007. Warner Independent also hosted 80 screenings of The Painted Veil in Los Angeles, New York, San Francisco, and London, as well as to various Hollywood guilds, to promote the film. The Painted Veil initially had a limited release in four theaters in the United States on December 20, 2006, grossing $51,086 over the opening weekend. The film gradually expanded its showings in the United States and Canada, peaking at 287 theaters on the weekend of January 26, 2007. The Painted Veil ultimately grossed $8,060,487 in the United States and Canada and $14,525,904 in other territories for a worldwide total of $22,586,391. On the film review aggregate website Rotten Tomatoes, The Painted Veil has received a 74% 'fresh' rating based on 143 reviews. On the similar website Metacritic, the film has received a metascore of 69 out of 100 based on 33 reviews, considered generally favorable reviews. Manohla Dargis of The New York Times said the story seems "so unlikely for modern adaptation, particularly when, as is the case here, it hasn’t been refitted with a contemporary hook or allegory for audiences who wouldn’t know Maugham from Edna Ferber. Instead, as nicely directed by John Curran and adapted to the screen by Ron Nyswaner, this version of the story lulls you by turning Maugham’s distaff bildungsroman into a fine romance. Even better, the new film gives us ample opportunity to spend time with Ms. Watts, whose remarkable talent helps keep movie faith and love alive, even in the tinniest, tiniest vehicles . . . An inveterate stealer and masticator of scenes, Mr. Norton is very fine here, especially early on, before his billing gets the better of the story and he begins riding around heroically on horseback . . . Whether through craft or constitution, [he] invests Walter with a petty cruelty that makes his character’s emotional thaw and Kitty’s predicament all the more poignant." Carina Chocano of the Los Angeles Times said the film "has all the elements in place to be a great epic, but it fails to connect, to paraphrase Maugham's contemporary E.M. Forster, the prose with the passion. It's impeccable, but leaves you cold." Peter Travers of Rolling Stone rated the film three out of four stars and commented, "If you're suspecting this third movie version of W. Somerset Maugham's 1925 novel may carry the infectious dullness of prestige filmmaking, rest easy . . . the film is a period piece propelled by emotions accessible to a modern audience . . . The Painted Veil has the power and intimacy of a timeless love story. By all means, let it sweep you away." Meghan Keane of the New York Sun said the film "may at times threaten to fall into an abyss of sentimentality, and it has moments that seem mere transitions to propel the plot, but it manages a charming historic portrait without insulting the audience's intelligence." Todd McCarthy of Variety thought the story "feels remote and old-school despite a frankness the two previous film versions lacked." He added, "Present scripter Ron Nyswaner makes some solid fundamental decisions, beginning with the telescoping down to the barest minimum the London-set opening . . . All the same, the film is still dominated by the stuffy, repressed personality of Fane, whose emotional stonewalling of his wife produces a stifling of Kitty's naturally more vivacious, if common, personality. Despite the extremes of human experience on view, there is a certain blandness to them as they play out, a sensation matched by the eye-catching but picture-postcard-like presentation of the settings . . . Even the ultra-capable Norton and Watts aren't fully able to galvanize viewer interest in their narrowly self-absorbed characters." Composer Alexandre Desplat won the 2006 Golden Globe Award for Best Original Score. Desplat also won an award for Best Original Score from the Los Angeles Film Critics Association for both The Painted Veil and The Queen (2006). Ron Nyswaner won the National Board of Review Award for Best Adapted Screenplay and was nominated for the Independent Spirit Award for Best Screenplay but lost to Jason Reitman for Thank You for Smoking. Edward Norton was nominated for the Independent Spirit Award for Best Male Lead but lost to Ryan Gosling in Half Nelson. The San Diego Film Critics Society honored him for his work in this and The Illusionist and Down in the Valley. The London Film Critics' Circle nominated Toby Jones Best British Supporting Actor of the Year. ^ "The Painted Veil". The-Numbers.com. Retrieved 5 April 2018. ^ "BoxOfficeMojo.com". BoxOfficeMojo.com. 2007-04-26. Retrieved 2010-10-08. ^ a b c d e Charles McGrath (2006-12-10). "Another Encore for the Most Adaptable of Authors". The New York Times. ^ a b Terry Armour (2006-12-30). "Edward Norton concentrates his passion on performing". Chicago Tribune. ^ a b c d John Horn (2006-12-20). "Trying to Get People to See 'Veil'". Los Angeles Times. ^ "The Painted Veil (2006)". the SoundtrackINFO Project. Retrieved 2011-01-06. ^ "Soundtracks for The Painted Veil (2006)". Imdb. Retrieved 2011-01-06. ^ "The Painted Veil (2006) - Weekend Box Office Results". Box Office Mojo. Retrieved 2007-12-05. ^ "The Painted Veil (2006)". Retrieved 2007-12-05. ^ "The Painted Veil". Rotten Tomatoes. Retrieved 2007-12-05. ^ "Painted Veil, The (2006): Reviews". Metacritic. Retrieved 2007-12-05. ^ Dargis, Manohla (2006-12-20). "''New York Times'' review". Movies.nytimes.com. Retrieved 2010-10-08. ^ "''Los Angeles Times'' review". Calendarlive.com. 2006-12-20. Retrieved 2010-10-08. ^ "''Rolling Stone'' review". Rollingstone.com. Retrieved 2011-03-10. ^ "''New York Sun'' review". Nysun.com. 2006-12-20. Retrieved 2010-10-08. ^ Mccarthy, Todd (2006-12-14). "''Variety'' review". Variety.com. Retrieved 2010-10-08. ^ "The 64th Annual Golden Globe Awards (2007)". Hollywood Foreign Press Association. Retrieved 2007-12-05. ^ "2006 LAFCA Awards". Los Angeles Film Critics Association. Archived from the original on 2007-10-11. Retrieved 2007-12-05.